Are you having trouble starting to wonder what to look for when deciding what hardwood flooring to choose? There are so many questions and several things to consider before choosing hardwood flooring for your home. Before you rush out shopping for on hardwood flooring, this article will illustrate to you some basic tips you should ask yourself before making your flooring investment. Timeless beauty, clean lines, strength, and durability, as well as the ease of cleaning and the classic look, make hardwood flooring the perfect choice for your home. No matter what your personal style is, there is a flooring choice for you because of the unlimited selection available. But before you rush out shopping for your hardwood flooring, keep these tips in mind. Set a budget for yourself. Having a broad range of flooring to choose from is great, but the downside is that it is easy to get overwhelmed quickly, and this makes you very susceptible to overspending. Remember to balance style with quality with your budget when you make your final choice. 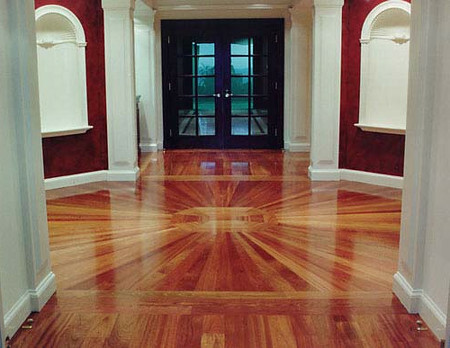 Tip #1 You will be wise to match the room with your choice of flooring, whether hardwood or otherwise. For example, do not try to put hardwood flooring in a bathroom, due to the high levels of moisture a bathroom receives. Tip #2 Different areas of the house demand various types of wood. For example, wood floors that have very light or very dark finishes typically do not fare well in the kitchen. Tip #3 Choose a hardwood flooring that has an appropriate finish to match your lifestyle. A sitting room that is seldom used will let you get away with a lighter finish. However, a hallway or living room will get regular traffic and requires a choice that offers a tougher finish that can stand up to a lot of wear and tear. Tip #4 Consider installation – doing it yourself or having a professional installer do it for you? Many people successfully install their flooring, but only after they have done their homework. It is often easier to hire a professional but do you due diligence when selecting a hardwood flooring installer. You will want to be sure that it will be installed correctly. Tip #5 Choosing the color and style of the floor can be the fun part. Choose a hardwood that fits your personal taste and your lifestyle. The comparatively high cost of the flooring and installation demands to choose wood that will not go out of style quickly. I appreciate the information on flooring to choose and I agree that it is important to have an array of options but not too wide of a selection. That way you will be able to narrow it down much more easily. I also think that breaking it up into categories like color, style, and design would help a lot. By doing that, you wouldn’t be persuaded by the design or style instead of the color. My husband and I are looking to have hardwood floors in our kitchen and living room this summer. We want to make sure that the style will match the rest of our home. Thanks for the tip about how very light or very dark finished typically don’t do well in the kitchen. We’ll be sure to pick something in between that will match the other colors in our kitchen.